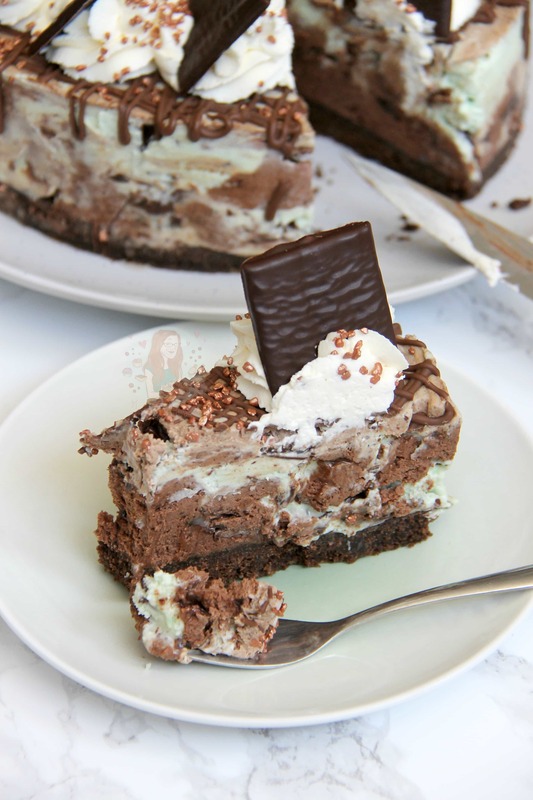 A Dark Chocolate and Mint Cheesecake full of After Eights. With a Buttery Biscuit Base, and Delicious Decoration, my new favourite… No-Bake After Eight Cheesecake! So one thing that I have always betrayed… is having an After Eight before 8pm. I know its just a name, but some take that seriously! I, will happily have them night or day as they are deeeeelicious. I love the thin Dark Chocolate layer encasing a smooth minty filling. I also love that they come in little packets to keep each one ‘safe’ but its just annoying when you need to chop the entire packet up to go into a cheesecake… thats a lot of packaging waste. 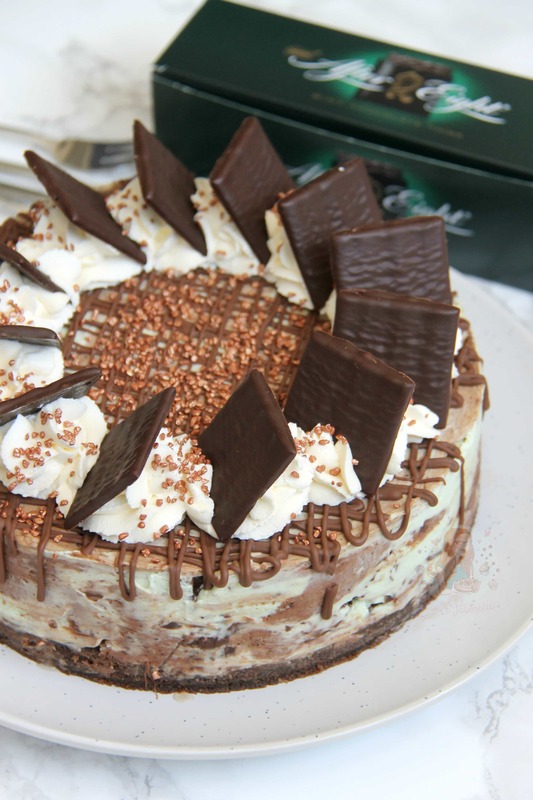 But hey ho, this After Eight Cheesecake is delicious! 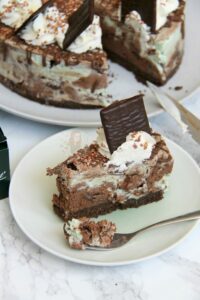 I remade my No-Bake Mint Aero Cheesecake recently and changed it ever so slightly by using a new base for my cheesecake – mixing digestives and cocoa powder with the butter to make a crunchy biscuit base. Honestly, its so yummy! I much prefer doing it this way compared to using a chocolate coated biscuit! I did change this one in comparison to my No-Bake Mint Aero Cheesecake by using two types of cheesecake in the filling. I used three types in my No-Bake Triple Chocolate Cheesecake and made sure that those layers were even as anything, but with this one? I wanted to keep it random and swirly. I decided to use Dark Chocolate in the chocolatey mix because it gives it a delicious flavour. You can use Milk if you prefer, but honestly, Dark is SO much better. After Eight themselves use dark chocolate on the coating, and when you mix the dark chocolate with the other ingredients its a lot sweet than you think. It makes the perfect partner to the minty mix also! 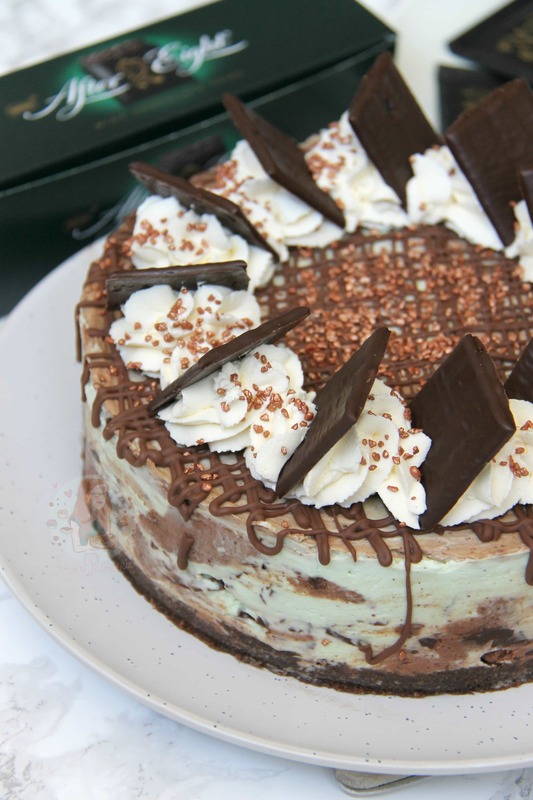 To make the Cheesecake Base – Blitz the Digestives in a food processor with the cocoa powder until it’s a fine crumb. Mix the biscuits in with the melted butter and press down into the bottom of an 8″/20cm Deep Springform Tin and refrigerate whilst you make the filling! Melt the Dark Chocolate carefully and leave to the side to cool slightly. Using an electric stand mixer, whisk together the Cream Cheese, Vanilla and Icing Sugar till smooth. Split the mixtures into two bowls. To one half, add the melted dark chocolate and mix together. In the other, add the mint extract and the food colouring and mix till combined as well. 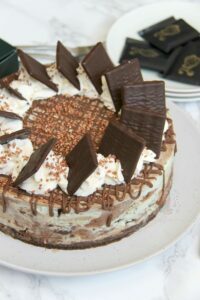 To both mixtures, fold through some chopped up after eights – I use about 150g of chopped after eight per cheesecake mix. When mixed, dollop the mixtures onto the biscuit base randomly and swirl them together. Smooth over the top – Refrigerate for 6+ hours to set, of preferably over night. Once set, remove from the tin. Whip together the Double Cream and Icing Sugar until thick and pipeable. 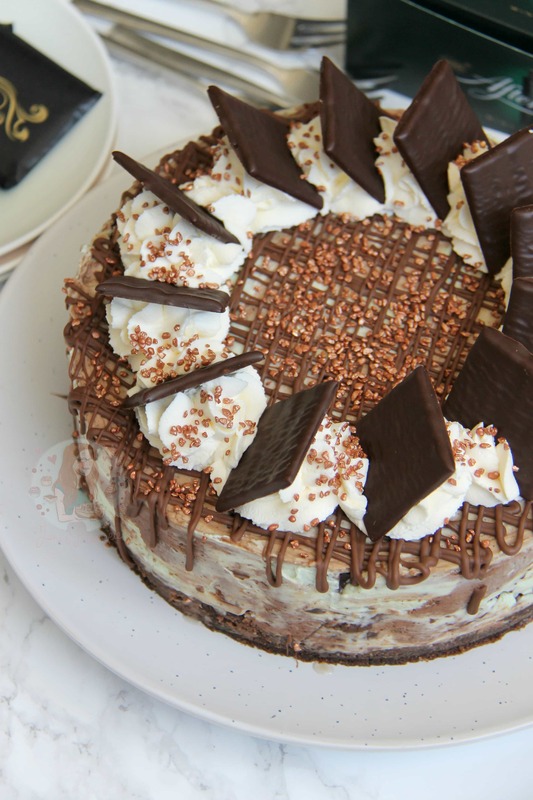 Drizzle over some melted chocolate, pipe on some of the delicious whipped cream, and add on even more After Eights! Enjoy! If it looks like your cheesecake isn’t setting, or its a but sloppy, or you’re even not sure.. try it anyway. Try to set the mix anyway! 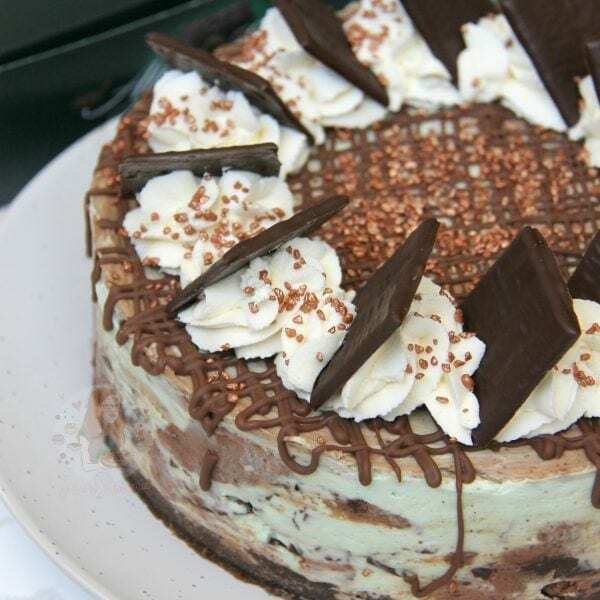 If it still doesn’t set, freeze it and have an Ice Cream Cheesecake! I recommend using a 8″/20cm Deep Springform Tin in this recipe! I use Green Progel Colouring in this recipe! I use a stand mixer to whip my mixture up. If using an electric hand-held whisk then try not to use too high a setting as this might cause it to over whip and go all icky! So take your time, it will be smooth and hold itself when the mix is ready! Using Full-Fat cream cheese is 100% needed so that it sets – if you would rather use a lower fat one be careful when you mix so that it doesn’t split, and it probably needs to set in a dish as it won’t hold itself! This recipe will last 3 days, covered, in the fridge! Older Next post: Black Forest Gateau! Newer Previous post: Strawberry Gin Sorbet! for the filling you mention After Eights and Aero (section 5) but no mention of Aero in the ingredents is this a typo or do you use both in the filling mixture ? It’s just after eights in this one! 3 days, I would wait until 23rd or 24th so it lasts longer! This looks amazing-do you think I could make it as mini cheesecakes using the same recipe if I used muffin tins/mini cheesecake tins? Yes I’m sure you could!